A great video is a reflection of an organized video production process and excellent project management. We get asked all the time about how we produce our videos. The following is a breakdown of the typical process for a live-action video. Before we actually begin creating the video, it all starts with an email or phone call from a business or individual looking to make a video. They may have a very good idea of what they want their video to look like, or maybe all they know is they need video. Either way, we ask lots of questions in order to understand what the video needs to be successful. After all, video is an essential part of a business’s branding, marketing, and sales strategies. We want to understand our client’s brand. Once we can visualize the video, we create a custom proposal, which includes cost information. When the client accepts the bid or estimate pre-production begins. During pre-production things like logistics planning, organization of crew, casting (hiring of actors or voice talent), scripting, shot listing, and creative meetings take place. Pre-production is all the planning that needs to take place to ensure production and post-production go smoothly, and that the goals of the video are reflected in the script. Pre-production can last anywhere from two weeks to two months. It really depends on the scope of the project. One thing that can definitely be said about pre-production is that it should not be rushed. Quite simply, production is when the cameras roll. It’s when “Action!” and “Cut!” are called. Video production services include in-studio filming, on-location filming, green screen filming, and aerial filming. Post-production begins when production ends. The raw footage is imported into computers, and editing begins. Clients will see the video at different stages and be able to provide feedback. If the video includes motion-graphics or is an all motion-graphics video, post-production is when those animations are created. The final step in post-production is the delivery of the final video, whether as an authored DVD or digital file. So in the end there are two experiences that matter: there’s the experience our client has during the process of video making, which we make as stress-free, fun, and organized as we possibly can, and there’s the experience the viewer has watching the completed video. Does it compel them to make a purchase, think of a brand differently, or pick up the phone? Our tried and tested process ensures our client’s videos do what they’re supposed to. 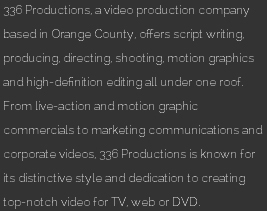 336 Productions specializes in commercial video production and web video production for a variety of industries and institutions. Whether you are a part of a large, global company, or a small business owner, you are going to video as part of your marketing campaigns, to educate people on your brand, services and/or products, and as a sales tool. Nothing informs and moves people like video. For more information of what’s included in each stage of the process visit our video production services page.